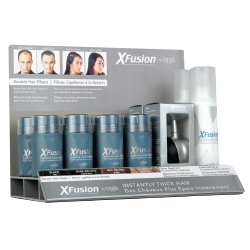 Instantly add volume or extra coverage for thinning hair with XFusion’s keratin-based hair fibers. This kit offers the top 4 selling fibers along with the patented Spray Applicator for more precise application. The Fiberhold Spray gives added shine and helps hold fibers in place. Kit includes: Black Keratin Hair Fibers – 2 ct., Dark Brown Keratin Hair Fibers – 2 ct., Medium Brown Keratin Hair Fibers – 2 ct., Light Brown Keratin Hair Fibers – 2 ct., Spray Applicator – 2 ct., and the Fiberhold Spray – 2 ct.